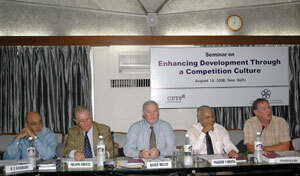 CUTS in association with the International Network of Civil Society on Competition (INCSOC) organised a seminar entitled, “Enhancing Development Through a Competition Culture” on August 14, 2008 at New Delhi (India). The seminar was organised as part of the sequence of events that CUTS hosted to celebrate its silver jubilee (25th year) celebrations. The seminar drew civil society organisations (from within India and outside), business associations and the legal fraternity. It provided an opportunity for the participants to get acquainted with new approaches that have been developed by the international competition community to help enhance understanding on competition issues. The linkage between Competition Policy and Economic Development was discussed at length in a panel comprising of international competition experts. Practitioners and scholars discussed technical issues like Abuse of Dominance; Cartelisation; and Mergers & Acquisitions, and tried to simplify the concepts to ensure better appreciation to suit the heterogeneity of the participants. On this occasion, Competition Toolkit for India was also released by Amitabh Kumar, Director General, Competition Commission of India. CUTS International and Consumers Federation of Australia jointly organised a half-day Seminar on “Enhancing Consumer Protection via Competition Policy” on 29th October 2007, from 0900 hrs 1300 hrs at Luna Park, Sydney, Australia. This seminar was organised under the banner of International Network of Civil Society Organisations on Competition (INCSOC) as a fringe events on sidelines of 18th Consumer International World Congress. Competition: why every consumer should care? Competition and Regulation: Making Regulated Industries Work for Consumers. A Panel Discussion on “Civil Society Participation in Evolving a Functional Competition Regime – How to Move Ahead in Africa” was organised on May 5, 2006 at the Cape Town International Convention Centre (CTICC), Cape Town, South Africa, as one of the side events of the Fifth Annual Conference of the ICN, a high profile global association of competition, antitrust and fair trade agencies. The Panel Discussion served as platform to release the final version of the book “Competition Regimes in the World – A Civil Society Report”. In one of the side events of the UN Conference on Trade and Development, held from November 14-18, 2005, in Antalya, Turkey, in the presence of more than 50 international delegates, CUTS CCIER released a book entitled “Competition Regimes in the World – A Civil Society Report”. The prevailing competition regimes in about 120 countries have been sewn together in this unique compilation. The members of INCSOC and other scholars have contributed essays on the state of competition across the globe. The book received huge admiration at the conference. The book released was the advance version.